I STOPPED AT the Argentine cemetery that also lies silent and still on a hillside not far from Goose Green at a place called Burntside house. The small, bright, white wooded fence that surrounds the cemetery is the largest of its type on the island. Row after row of white wooden crosses bare testimony to the depth of their mother’s sorrow. I walked from grave to grave. For identification, most of them only hold a small white plaque with the words: ‘An Argentine soldier known unto God’. The Falkland Island Government would like the bodies of the Argentinians to be repatriated to Argentina, but the Argentine Government has refused this request. According to them, the dead soldiers of their ‘Malvinas’ war are already buried in Argentina and to allow the bodies to be flown back to Buenos Aires would be to admit that their soldiers died on foreign soil. In the spring of 1991, families of the Argentine dead visited the graves at Burntside. They were flown into the military airbase at Mount Pleasant and helicoptered by our military to the cemetery. They never met a Falkland Islander and a Falkland Islander never met them. There were more families than graves. For a few, the graves of their sons were marked. For most, all they could do was adopt the grave of one of the soldiers ‘known unto God’. The cemetery was a sad and lonely place and for me it brought back more memories of the war than any other part of the island. Thirteen years on, the sympathy that we Paras held for our enemy after the battles was still there. A sympathy that stemmed from our professionalism. No one had forced us to go to war. And when we did have to go, we were ready and trained well for it. The Argentine conscripts were not. Parked close to the cemetery were the new expensive-looking Japanese Shogun four-wheel drives belonging to the young Falkland Islanders who were going to drive me back to Stanley. Rock music blared from their car stereos, interrupted only by the laughter and conversations of the happy young islanders inside. It didn’t seem right to me that anyone should be enjoying themselves near such a place, and finally I could take no more and asked them to please turn their engines and music off. One of the young islanders asked me how many Argentine graves there were. I replied that I thought about 240. I hadn’t counted yet, ‘Whatever it is,’ interrupted one of the young women, ‘it’s not enough of the bastards.’ With my anger showing, I suggested that maybe if she had been responsible for putting some of them there she might not feel that way. The music and engines were turned off. I returned to the gravesides to spend some more time with the dead soldiers used by that wicked South American military dictatorship. On the return drive buck into Stanley I began to realise that my earlier thoughts towards those happy young islanders were harsh. During, the war in 1982 all of them would have been small children who, along with their parents, had been taken from their homes at gunpoint and held captive in the community centre at Goose Green. Even my war wasn’t as bad as that. On my final day on the islands, I visited our military cemetery at San Carlos. It is a beautiful cemetery. It looks out on to the now still waters of San Carlos bay, where so much damage was caused to our ships in 1982. The lawns are well tended and the stone wall that surrounds it has been built with care At one end, on a large wall, carved in stone, is a memorial to the sailors, soldiers and airmen who gave their lives in 1982 who have no grave but the sea. Standing before it I felt, at 36, all of 86. I felt like one of those old men I had seen so much of on my television lately, standing and crying and remembering in front of similar walls in France. 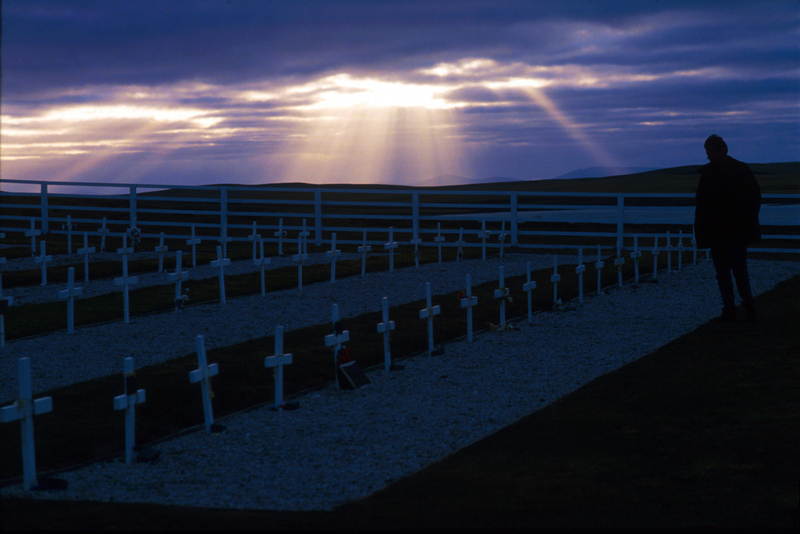 Below the memorial are the graves of the men whose families wished for their bodies to remain on the islands. Four of these graves are those of soldiers from my battalion. Private Holman- Smith, aged 19. Captain Dent, aged 34. Colonel Jones, aged 42. And Private Slough, aged 19. I stood before the graves of my dead comrades and remembered times when we had no thought of death. I stood before Colonel Jones and again thanked him for his sacrifice to us on that day in May. At Private Slough’s grave, I picked up a small statue of the Madonna, encased in glass that the wind had blown over. At Private Holman-Smith’s grave, l felt sad that I had no memory of ever meeting him when he was alive. And at Captain Dent’s grave, I once again became a breathing sorrow. It was the words inscribed upon his headstone that did it: ‘Chris, your smiling face we shall never forget, Kathy and son Robert.’ And, even 13 years on, there lies the true tragedy of the Falklands war. Of any war. There are too many Kathys. Too many Roberts. And still they mourn. Two hundred and fifty five dead in 1982, plus 777 injured. lt’s a lot of sacrifice. Since the war there have been many explanations for why our nation put so much into liberating so few. To get Thatcher re-elected is a favourite. So is the Argentine’s military Junta`s need to do something popular. So is the protection of Antarctic oil, gas and mineral rights. So is the Armed Forces’ desperation to hang on to their budget. I have even heard it argued that the Falklands war was about freedom and democracy and the rights of the Islanders. I discovered on my return to the Falklands that I couldn’t look an islander in the eye and say: ‘Hey, I fought for you.’ I’d simply walked into an Army careers office and signed on the dotted line. The Falklands could have been Lapland. The Argentinians could have been Taiwanese. Wouldn’t have mattered to us. We would have done exactly the same job. The islanders were Bennies. In the war, we were looking after the next soldier over, not them. We liberated them almost as a side-effect of trying our best to save our fellow soldiers’ necks. 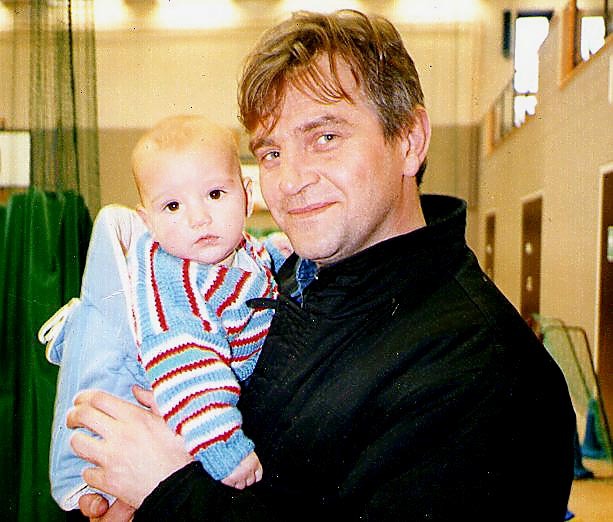 Prior to meeting Kevin, I couldn’t imagine that such people existed: a soldier who fought in the Falklands war – listen to this! – ending up moving out there. To live! Forever! Who would ever want to live there? He mentions the community spirit, the safety, the schools. What a place to bring up kids, he says. Those teacher to-pupil ratios that Japanese parents would commit hari- kiri for. Sixteen subjects up to GCSE level, as well as vocational qualifications. And budding Einstein’s can get a Falklands Government Scholarship, courtesy of the money from the fish, to go to a sixth-form college in Winchester, Hampshire. It was all rather different when Emma Steen, daughter of a shepherd, started at school 70 years ago in the settlement of North Arm. ‘We used to have school in the Camp. The teachers would come and visit for three weeks at a time.‘ Emma’s grandparents came to the islands from Scotland in the 1860’s. She has two children, 12 grandchildren and 11 great- grandchildren, all still on the Falklands. There is no fear that she will sit out her days in solitude, like many a seventy-something in the seaside towns of Britain. On my last morning on the Islands I visited the new Leisure centre, where something strange came over me. There was a morning crèche taking place and l finally felt truly proud to have been a member of our Task Force. It was the sight of the young mothers and their children that did it. Because 1982 we’d prevented a jumped-up bunch of military animals – not the people of Argentina but the generals in charge – who would murder and torture and ‘disappear’ tens of thousands of their own people with no qualms, from ruining the lives of this new generation of islanders. So, until you have seen their lives at first hand, please never again ask of the Falklands: ‘Who would ever want to live there?’ It wasn’t for nothing. Awesome read as always Ken, very moving. Often people do think that its for the people we fight, when often its for the guy next to you. Hindsight is, often, the cruellest mentor, but that’s a soldiers lot. I’d love to visit the Falklands, just to see what you guys have managed to give them. Thanks for sharing buddy. It is a very nice story of somebody who had to come to terms with a land he didn’t know with people more British than the British living there and who deserved protection. Let us hope that no British Government ever confuses the Argentines again, the UK has to keep its military hardware somewhere and its military too and train them on different terrains, the Falklands are fine for that, this is a small price in comparison to so much suffering on both sides. Also it is clear that Argentina doesn’t want to know of reason nor to discuss sovereignty, their European population from different countries to ours only look to a transfer of culture and sovereignty that is the only Malvinas solution in their constitution. The islanders are right, sovereignty shouldn’t be “discussed”, people with “bright” ideas can only do damage and make those cemeteries even bigger. Such a sacrifice had to be done once, but should never have to be requested again.